In the ancient time, before the invention of metal and clay pots. Humans have been boiling water in large cup-shaped leaves. So, this is an old method of boiling water. But, just for fun and learning how it works, we will boil water in a bag made out of paper. Make a simple cup-shaped paper bag with the help of scotch tape. 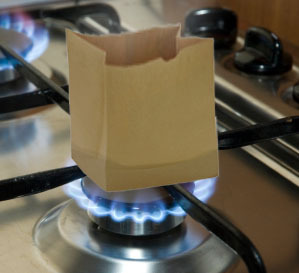 But remember to keep the bottom area of the bag larger than the area of the fire of your gas stove. Put your bag on the gas stove, and fill the bag with some water to boil. Start fire gently, and keep its flame-level lower than the corner and sides of your paper bag. Otherwise, sides of your bag may burnout. Wait until water starts to boil. If you have a household thermometer use it to check water temperature to find out how fast the temperature is rising. You may wonder how a thin sheet of paper has survived the hot flame. It is because the paper has the ability to absorb water. When you have poured water into your paper bag, it absorbed some water. This absorbed water prevented the bag from burning in the flame. But, the flame was keeping the paper dry to hold the water. In this way, the water that became hot went to the surface and cold water took its place. This process continued and water started to boil, as the temperature reached the 100 Celsius. Abdul Wahab, "Boil water in Paper bag," in Science4Fun, April 13, 2019, http://science4fun.info/boil-water-in-paper-bag/.